Quantities are approximate. There is lots of room for adjustment. Nothing needs to be finely chopped because in the end it all goes into the blender. Cut off and discard (compost!) tough ends of asparagus. Cut off tips and set aside. Chop rest into pieces (1 or 2 inches long). Toss with 1 T. olive oil. Roast in 450 oven. Stir every 5 minutes or more. Remove when lightly browned. Roast the tips in the same manner, but keep separate from other parts of asparagus. In a large skillet, saute onions and garlic in 2 T. oil till golden. Stir in onions/garlic and roasted asparagus, EXCEPT the tips. Put pureed mixture back into pan. Stir in roasted asparagus tips. Bring back to a boil. 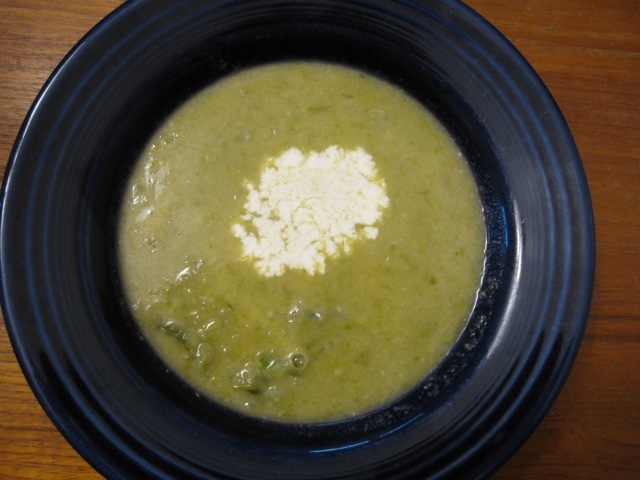 Serve with whipping cream or yoghurt which each person can stir into his/her own soup. Use sour cream instead of whipping cream or yoghurt.